Many tourists who enjoy factory outlets shopping in Hong Kong would likely have heard or known of Citygate Hong Kong. Not many tourists, however, know about the Prada factory outlet in Hong Kong as it is located in a residential district away from the usual tourist haunts. Needless to day, those who know the existence of this prestigious fashion brand would want to get there! 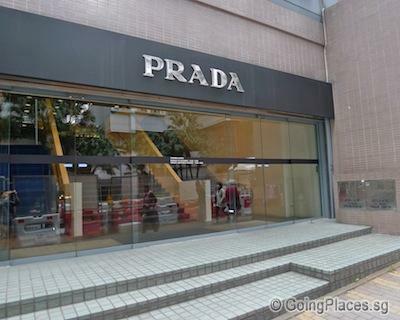 As Hong Kong Prada factory outlet, aka Prada Space, is located in the residential area and not near any train station. It is only accessible by tax or bus. The good news is during my recent trip to Hong Kong in Dec 2012, I saw an MTR station near South Horizons is under construction, so the next time when I visit Hong Kong again, I may be able to take a train there. Space is an official Prada outlet in Hong Kong that sells older season products of brands like Prada, Prada Sport, Miu Miu and Car Shoe. It offers a good selection of women’s and men’s clothing, sunglasses, accessories, shoes to bags at awesome bargain prices. 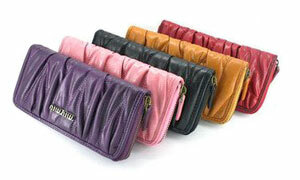 This is a not-to-missed shopping tour as a Prada wallet can be marked down by 65%! The experience of shopping in Prada factory outlet is the same as shopping in any prestigious Prada outlets in high-end shopping malls, yet prices are slashed nearly in half. 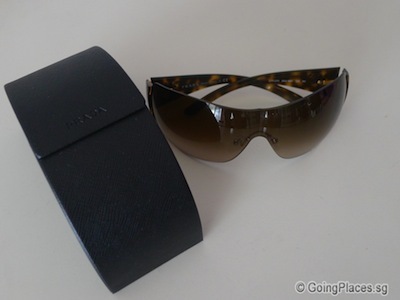 I couldn’t resist the temptation and bought a stylish Prada wraparound sunglass at around S$200. Prada fans can be rest assured that the products are genuine and fill their suitcases with full of loot. The only downside is popular shoe size like 6, 7 are usually not in stock. If you are staying at hotel near Tsim Sha Tsui then it’s quite convenient to visit Prada Outlet in Ap Lei Chau by taxi or by bus. 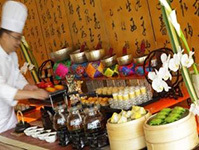 If you have not booked your hotel yet, check out these hotels near Tsim Sha Tsui MTR along Nathan Road. Prada Space factory outlet Hong Kong is situated in Ap Lei Chau (鴨脷洲), south of Hong Kong island and the most convenient way is to get there by taxi. The taxi fare from Tsim Sha Tsui to Ap Lei Chau is HKD150-HKD200 depending on the traffic condition. If you cannot speak cantonese, get the hotel concierge to translate the address and show it to the taxi driver. Alternatively, you can take the public bus to Prada Space outlet. The bus fare is between HKD4.70 and HKD6.90 one way to South Horizons Bus Terminal from the following locations. If you need the most updated bus timetable, visit Hong Kong Citybus Guide.